On Thursday 26th January there was a debate/discussion on ITV's This Morning. The discussion was called "Can a woman be successful without wearing make-up"
I took to twitter to express my frustration and looked through the #Thismorning hashtag to find my blood boiling even more. Some of the comments made really got on my wick and I was disgusted at some people's responses to this discussion. There are lots of other ways to take pride in your appearance OTHER than wearing make up. I was disgusted to hear that ...... wouldn't employ someone if they didn't wear make up. Where is the logic? 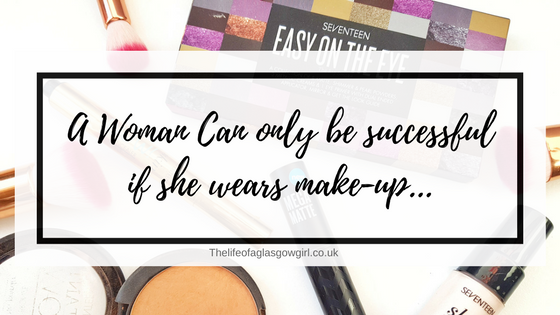 Why does wearing make up automatically define your success? IT DOESN'T. It really, really doesn't make you less successful if you have no make up on in the work place. Would they hire a man who doesn't wear makeup..... I mean... would they? Going by the logic they must only hire men who wear make up because why would they only hire women who wear make up? Oh that's right, double bloody standards. A man is judged on his abilities and his skills within the work place, he's judged on how good he is at his job, not wither or not he's wearing a bloody mac lipstick with some Urban decay foundation and benefit mascara.... so why should women be judged on this rather than how good they are at their job. This topic really hit a nerve with me. A woman should be wearing make up for herself, not because her employer makes her or she fears she will loose her job if she doesn't get that face on first thing in the morning. By no means am I having a go at those who wear make up, that's not the point. I wear make up, I love doing my make up! But I sure as hell wouldn't be doing it for my boss so they would actually take me serious in my career. What's your thoughts on the matter? It's a good job my current employer didn't use make up as hiring factor, I wouldn't have got the job, I hardly ever wear make up! I have no issue with people who wear make up - if I wasn't so determined to spend that extra ten minutes in bed in the morning I probably would be a little more inclined to do so but I'd hate to think that my not wearing make up would be the deciding factor in me getting or not getting a job. Obviously I make sure I'm presentable for work, I'll do something with my hair, and make sure I follow the dress code, though casual Fridays when I can go in in my jeans is my favourite day! The only career I can see it being more of an issue would be something like a flight attendant where it is expected. I also have issues with dress codes that demand women wear heels. Now I love my heels and I'll often wear them to work, but you'll also find me in my ballet pumps, I'd certainly not be happy if I was forced into my heels every day! I find this topic so sad to hear and I'm glad I wasn't watching on this particular day! I don't think it should matter either way if you wear makeup or not to work. I personally don't wear any at all, those I work with are older and really couldn't care less if I'm honest. But it's also the fact that we should be made to feel confident in the way we look, and be praised for not wanting to wear makeup all the time. We get slated for wearing to much, then put down for not making an effort so they say. It makes me so angry how in the media and this world, we can be told off for being to fat, and then another minute we are to skinny. It goes on with so many things and it's so frustrating! Wow! I can't believe this was an actual discussion. A woman can be a hundred times successful with or without makeup. How in the world do they even think that wearing makeup will determine the success of a woman? I work in advertising and I dress business casual everyday and sometimes I wear makeup and most of the times I do not. I have been recognized numerous times for my work in this company and I'm pretty sure it wasn't because of my looks. I carry myself in a professional demeanor at all times and I get the job done. Thank you for a great post Jordanne! I definitely feel the frustration with this. I can't believe this is a genuine thing people believe! It's ridiculous, and downright sexist. I also think it begs the question - is a woman with lots of make-up better than only a little bit of make-up? I'm sure that wouldn't be the case because there's always a "oh she wears too much make-up", so again it's a stupid double standard! OH MY GOD. I am so incredibly filled with anger after watching that video. I actually feel a bit sorry for that awful woman. She's suffering from internalized misogyny.